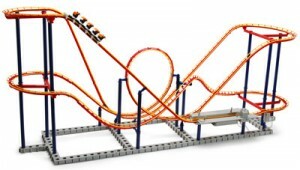 This kit contains everything you need to build your own fully operational roller coaster which measures over four feet long. The highly detailed train car comes pre-assembled and even has shoulder restraints that raise and lower at the operation station to load your invisible passengers. Pop the included software into your PC and you can even “ride” your roller coaster, seeing the view from any seat and getting a real-time readout of G-forces and acceleration.